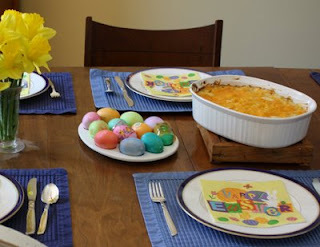 As I mentioned in my earlier post about Easter, I misplaced most of my usual Easter recipes so I tried a bunch of new recipes this year. Most were tasty -- good enough to share -- but none of them made me call off my search for my favorites. I served Baked Ham with Bourbon Glaze, which I liked but my husband didn't, because he doesn't like sweet sauces or glazes with meat. Grandma's Cheesy Potatoes are ubiquitous, I think, because Wegmans often seems to run out of the frozen hash brown potatoes. 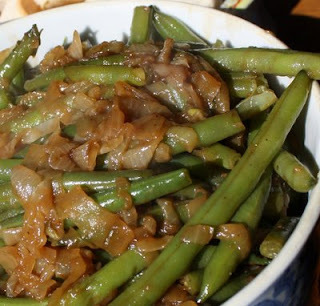 The Green Beans with Caramelized Onions was the best recipe of the bunch, but frankly I think caramelized onions are something you can put on just about anything and it will taste better. Oh, and I made a truly awful mustard sauce that looked and tasted something like paper mache paste. I didn't even put it on the table. Here are the recipes. Microwave honey and molasses in a 1-quart glass dish at HIGH 1 minute. Whisk to bend. Whisk in bourbon, orange juice and mustard. 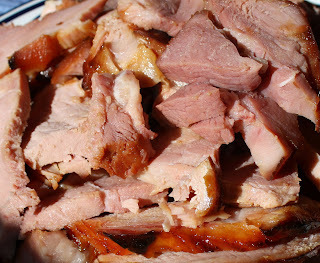 Remove skin and fat from ham; place ham in a lightly greased 13- by 9-inch pan. Make 1/4-inch-deep cuts in ham in a diamond pattern. Pour glaze over ham. Bake on lower oven rack at 250 for 2 to 2 1/2 hours or until a meat thermometer inserted into the thickest portion registers 140, basting every 15 minutes with glaze. This was a recipe Grandma used to make, but I've seen lots of variations of this recipe. I've lightened these a bit from her original recipe ... also replaced chopped onion with dried onion flakes. They need to be cooked for about 90 minutes to get the potatoes soft, which is longer than the original directions. Combine first six ingredients, reserving 1/2 cup cheese for the top. Mix in the hash browns. Put in greased 9" by 13" Pyrex pan. Sprinkle top with reserved cheese. Bake at 350 degrees for about 90 minutes. Trim benas. Cook beans in boiling water to cover 5-12 minutes or until desired tenderness (remember they will cook a little longer with the onions). Drain and set aside, or cover and chill overnight, if desired. Meanwhile cut onions in half, then cut into thin sliced. Melt 1 Tablespoon butter in a large nonstick skillet over medium-high heat, and add onions. Cook 8-10 minutes (stir only if onions are really scorching). Continue cooking onions, stirring often, 15 to 20 minutes or until golden (reduce heat if they are burning). Reduce heat to medium; stir in remaining 2 Tablespoons butter and brown sugar. I love seeing your set table. It reminds me of the good old times. And, I think I recognize the trivet :-) Glad it all worked out despite the mustard sauce. The green beans look delicious. You should also recognize the place mats. I bought them from you at your garage sale (or maybe you gave them to me)! Oh come on, Tracy, tell us which mustard sauce it was. Just kidding. The worst thing I ever made was the Red Pepper Soup from The New Basics Cookbook. It had red peppers (which cost me a fortune), ginger and tomatoes. It was complete dreck. Sue, I linked to the mustard sauce so that you don't make the same mistake I did! I love the New Basics Cookbook. I'll have to make a note for myself NOT to make that soup! Bourbon glaze, wow, that sounds so yum! Ham, potatoes, and green beans sounds like a delicious Easter dinner. I agree about the caramelized onions! They make everything taste better. I'll bet that bourbon glaze took your ham to a whole nother level. The ham photographed beautifully.